Dominance Electricity is far from being a fruit of the current electro boom, because the German label run by Matthias Weise kicked off almost 20 years ago and boasts a notable back catalogue with Blastromen, Imatran Voima, Kalson and other artists. 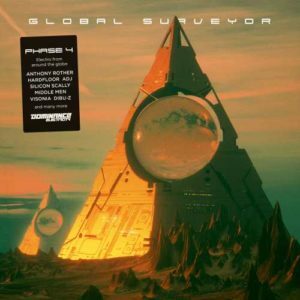 The concept of the “Global Surveyor” dates back to the label’s beginnings and the fourth installment is a monumental effort again. Although four-five artist samplers are pretty common in today’s electro, you won’t see too many as heavy packages. Of course massive time capsules of Aleks Stark‘s Fundamental Records are in a league of their own and recently Scopex‘s tracks were repressed in quadruple vinyl, but still a 24-track compendium is an exception. Not only because of its volume, but of the quality as well. As expected, the key role is played by straightforward (European) electro of bold 808 sequences and etching acid lines, with abyssal tones facing delicate layers. The eye-catchers are the scene’s usual suspects, like Heliopause, a project of Aux 88 and Dynamik Bass System, in the Detroit-rooted opener “Electro City”. Formidable Carl A. Finlow’s long-running project Silicon Scally is piloting the atmospheric “Machine Bias”, while in “Matrix”, Anthony Rother predicts technological singularity, accentuated by female speak in German. Among well-known acts is Hardfloor, making a solid appearace with caustic sinusoids in “Diet Starts Monday”. Good picks are Kalson‘s ‘theme song’ “Global Surveyor” and Obsolete Robotics feat. Phil Klein’s robotic combat song “Walk Alone”. However, for more variation IDM and ambient side is represented as well (Keen K, Energie Principle, Visonia). There seems to be many new names, but actually several of them are Bandcamp operatives getting deserved ‘vinyl credibility’: N-Ter, co-founder of the Croatian Crobot Muzik, comes with bewitching arp parade “Agram Sunrise” and Amper Clap, who runs the excellent Urban Connections netlabel from Spain, enters the game with punching roller “Desolation”, remixed by Robyrt Hecht. Also from the self-released sector are the Russian project Low Orbit Satellite and Pi-xl, whose robust “Disciplinary Action” is one of the highlights. Thus the compilation’s value does not only lie in a well-chosen sound exhibit, but it also helps to explore lesser known artists or even newcomers (Tekkazula, Energy Principle, Wilx, C*NT, Tyraell). The lineup of “Global Surveyor”, released in full across all formats, stands for its name because the artists come from about dozen countries, from Australia and Chile to Finland and Japan, not forgetting the host country Germany. I lektro 4n answer! Not enough acid for this trip!! What a wonderful compilation!! !Long live Elektro, Thanks Matt and Dominance!!! !